This PDF 1.5 document has been generated by Acrobat PDFMaker 11 for Word / Adobe PDF Library 11.0, and has been sent on pdf-archive.com on 01/10/2016 at 11:27, from IP address 71.228.x.x. The current document download page has been viewed 778 times. File size: 238 KB (7 pages). Medicare Advantage, Prescription Drug and Dental plans in Tennessee. insurance and Prescription Drug plans. Lucky for you...Medigap Tennessee is here to help. from Risk Management by now that states you will be losing coverage at the end of the year. apply to you...unfortunately, you're still stuck with Obamacare like the rest of us. coverage to retirees in the first place. coverage you're losing from SHARP. different words for the same thing. 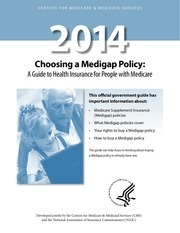 Medicare Supplemental options available to you in the market. companies being offered through the AON Exchange. their group coverage and sent them to AON to find replacement insurance. overpriced Medigap options they are able to offer you. monetarily, it's simply not the best option for consumers that need to replace their loss of coverage. country, so this will apply to most of you retirees going through this transition. be shown options to replace the SHARP coverage that you're losing. Medigap Plans. Medicare Advantage Plans ARE NOT secondary insurance plans...they are very different. coverage...only one or the other. copays, networks, etc...the list goes on. from your SHARP coverage...and therefore I would not advise you to go with that option. products to you in depth. coverage and then also add a stand-alone prescription drug plan for your medications. leftover in your HRA after paying your new insurance plan premiums. 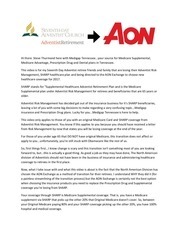 AON exchange in order to qualify for your HRA reimbursements going forward. receive your ongoing annual HRA reimbursements. them all through the AON Exchange in order to get your full HRA deposits. exchange so you'll be qualified for full HRA Reimbursements. CMS (the Center for Medicare and Medicaid Services). allowed to compete...you, the consumer, win! company OUTSIDE of the AON Exchange and here's why. a more competitively priced company that isn't offered through the AON Exchange. Medicare or that she might incur for the rest of her life. of her own pocket for the balance. balance of your plan premiums, copays, and coinsurance costs going forward. maybe more? You do the math...clearly someone at the North American Division hasn't. elsewhere...and we are comparing apples to apples here as these plans are standardized by CMS. over the course of your policy life. in order to save a substantial amount of HRA money going forward. Exchange when using the web portal or when you have your appointment call. prescription drug plan for the specific medications that you're taking. good coverage, but if you'd like a competitive quote there as well...I can also help. annual HRA reimbursements as long as you get your drug plan through the AON Exchange. record the call...just give it a listen. when navigating this transition from SHARP. This file has been shared by a user of PDF Archive. Document ID: 00489853.